It may not be the Ghostbusters firehouse, the McCallister home, or The Goonies’ place, but Sad Hill Cemetery probably means something to your dad. Located in northern Spain, the location where Clint Eastwood stared down both “the bad” (Lee Van Cleef) and “the ugly”(Eli Wallach) in Sergio Leone’s epic 1968 spaghetti western—constructed for the film by several hundred Spanish soldiers—is now overgrown with trees and shrubs. 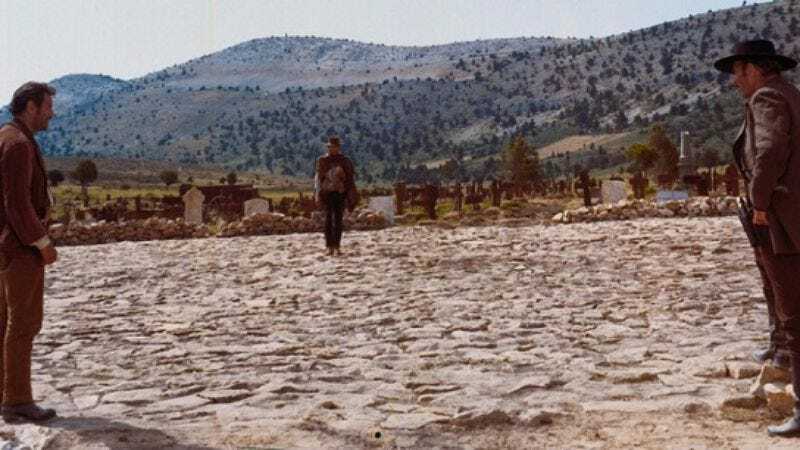 The restoration is being funded by donations, which “[offer] fans the chance to sponsor a grave marker in the cemetery.” In addition to restoring Sad Hill, Alba hopes that that a nearby site that was used as a prison camp in the film will attract Man With No Name fans from around the world, perhaps including Eastwood himself. “We sent a letter to his producer. It would be a nice homage to this land where he grew as an actor and filmed what has become an icon of the Western film genre,” he tells The Guardian. Eastwood is reportedly negotiating with an empty chair regarding an appearance.